Gearbox hinted at a new character class at South by Southwest a couple weeks ago. Now at their Gearbox panel at PAX East, they’ve finally let the psycho out of the ward and shed new details on a level cap increase and more. 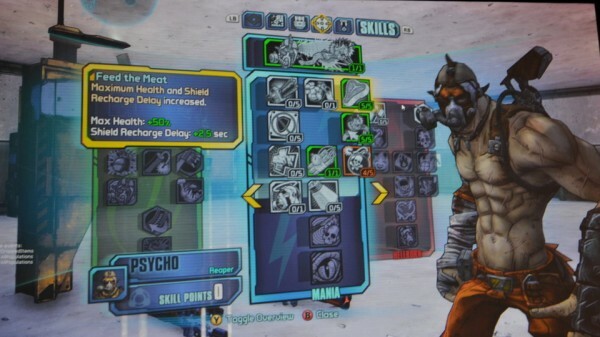 First, the new sixth playable class is Krieg the Psycho and looks very similar to the Psycho enemies of the series. He’s very melee-focused and will be able to deal more damage while taking damage so he’s more of a front-line kind of class. He has three skill trees with Bloodlust giving you more survival for the amount of attacks done with your axe (both a long and short-range weapon), Mania increases your damage as you take damage, and Hellborn increases your fire damage and when you’re on fire, makes you a lethal weapon. Secondly during the panel, they announced the level cap increase will be coming on April 2 for $5 or free for Season Pass owners. It’ll be bumped up to 61 and will also include gear that starts at level 51 and goes up to 61 entitled Pearlescent gear. There’ll also be some free DLC with third playthrough option called Ultimate Vault Hunter mode. Sounds like a lot and there’s still more to come, let us know in the comments how you feel about the new character class and level increase or post in our forums.